It has been a couple of months now since the news broke about contaminated peanut butter and the salmonella outbreak, but products are still being recalled. So many products, from salad dressing to pies, contain nut products, so make sure you check the FDA recall list to make sure your favorite brand is safe. The thing is, my kids looove PBJ. And peanut butter is really too yummy and healthy to give up. Especially since there are still plenty of safe peanut butter brands out there. Even better news is that some brands don't just stop at "safe", they also do away with artificial ingredients along with the salmonella -- like Maranatha Nut Butters. Every product in their line is free of artificial flavors, colors and preservatives, and they have organic, salt-free and raw ingredient options. So my kids get still get safe, healthy sandwiches in their lunchboxes. 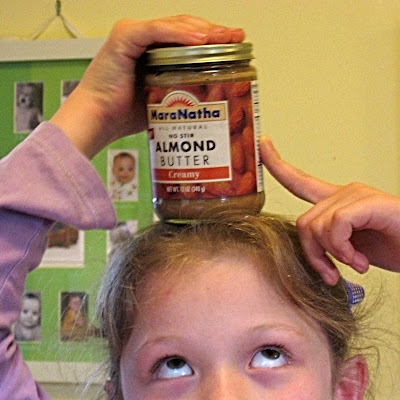 Maranatha nut butters get the green light from many green lifestyle blogs for their natural, organic ingredients-- and they get the green light from my kids for taste, too. We recently tried Maranatha's All Natural Almond Butter -- I had never tasted almond butter before and I'm hooked! It has a natural, fresh taste of almonds, with just a hint of sweetness from natural cane sugar. I got the No-Stir variety because I hate having to stir natural nut butters when they separate., and it's just as easy to spread as your typical mass-produced brand. Leave a comment on this post with your email address and tell us which kinds of nut butters you have tried -- peanut butter, almond butter, sunflower butter, soy butter, you name it! This entry MUST be completed for all other entries to count. 3) Follow Bonggamom Finds (bonggafinds) on Twitter (leave a comment with your twitter id). 4) Follow Bonggamom(bonggamom)on Twitter (leave a comment with your twitter id). 5) Follow Bonggamom Finds on Blogger(leave a comment with your Blogger profile name). 6) Follow Finding Bonggamom on Blogger (leave a comment with your Blogger profile name). For each extra entry, please leave a separate comment (don't list down all your extra entries in 1 comment!) . This giveaway ends at midnight PST on April 2, 2009.; I will draw a winner at random on April 3 and post the winner's name on the same day. For additional giveaway rules, click here. Good luck! we have tried almond, cashew, peanut, and sunflower butter over here! thanks for hosting the giveaway! I love Marathana NoStir Peanutbutter -- it's so yummy! I've had soynut butter (when I was young) and peanut butter. We've tried peanut butter and almond butter. I thought the kids would love the almond butter but they prefer the standard peanut! I follow Bonggamom on Twitter! I'm TechSavvyMama! I follow Bonggafinds on Twitter! I'm TechSavvyMama! I'm following you on twitter too. (Stimey). I have tried almond and peanut. My daughter and husband are peanut butter fanatics! I have actually tried this brand before and loved it! I have tried soy nut butter, almond butter, cashew butter, and of course peanut butter. And Nutella, what kind of butter is that? I mean it says hazelnut but why is it chocolate flavored? I've tried peanut and hazelnut butters. Almond and cashew butters sound great though and would like to try them. 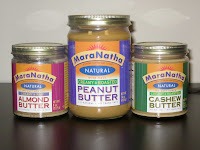 haven't ever seen marantha brand, but have tried many nut butters and love them all! I've only ever tried peanut butter, but I'd really like to try almond butter. I love almonds! I only tried peanut butter. I would love to try the almond butter. Thanks for the great giveaway! I have only tried peanut butter. The others sound great! I'm a Vegetarian and I have tried a LOT of different nut butters, but NOT Maranatha Nut Butters. I have sampled Peanut Butter of course! Almond Butter, Cashew butter, Soy Butter, PB2 (Defatted Peanut Flour that you re-constitute! ), Nutella, and I am sure there are more, I just can't remember! Lately I have been grinding my own because I live in GA and I am a nurse and I am scared because of the Salmonella outbreak! I am following Finding Bonggamon on Blogger Finally! I've tried peanut and almond butter. Yum! I have tried apple butter and peanut butter. The only nut butter I've ever eaten is PB but I love nuts of all kinds. I've tried cashew butter before and it was delicious. I've only tried peanut butter :) *Thanks* for the giveaway! I've tried almond butter and I love to substitute it for peanut butter. I never liked peanut butter as a kid. It was only as an adult that I started to like it. Then I bought peanut butter by the five pound can, LOL! I haven't tried any other nut butters yet. I have only tried peanut butter, but would love to try the almond and cashew butter. They sound delicious! We have tried just plain peanut butter. I would love to try more flavors!! peanut butter and almond butter. my son is a vegetarian, so any yummy way to get protein in his diet rocks with me. Thanks! I have tried them all. My favorite is Soy Nut Butter if I am eating it with something (like jelly), but I love almond butter straight out of the jar. would love to try something new. Thank you so much! I've never tried anything but peanut butter and I'd love to try something new! While I've never tried any kind of nut butter besides good ol' peanut butter - I have REALLY wanted to treat myself to cashew butter!!! It sounds YUMMY!!! I have only tried peanut butter but would love to try some other kinds. I've only tried peanut butter and apple butter. But I'm open to new flavors. Please accept my entry. Thank you. I have only tried peanut butter. I have tried peanut butter and almond butter and I love love LOVE almond butter. It is delicious when making French Toast. Three slices of bread, with almond butter slathered between each slice and sliced almonds sprinkled on top. Toast it, and then sprinkle powdered sugar and cinnamon over! Scrumptious! I have tried cashew butter. Good, but amazingly sticky, way more so than peanut butter. we use a lot of peanut butter & I'v tried soy butter. I would love to try the cashew butter. I've had good ol' peanut butter and eat almond butter often. I also really like sunflower butter. I've tried macademia nut butter and cashew butter too! I have had cashew butter and almond butter. I like the cashew butter but it is pretty rich. I LOVE PEANUT BUTTER! That's all I need to keep me happy. I have not tried nut butters, I did not even know about this untill I came across your review. I am excited to try them now! I love almond butter and peanut butter also. The soy butter is pretty yucky. I'm following bonggamom on twitter (username is elkaye). The only nut butter I've ever tried is peanut butter because I didn't know that other kinds of nut butters even existed. I love peanut butter and cashew butter. Thanks for the giveaway. Peanut butter is definately one of my favorite foods. I have also tried cashew butter. Peanut butter. I would love to try almond butter. I LOVE cashew butter, and like almond and peanut. The one I want to try is macadamia - sounds delicious! Please put me in the drawing. I love peanut butter, but would also like to try some of the others. Have only tried peanut butter and hazelnut butter. We have only tried peanut butter. peanut butter, cashew butter, soy butter, but I've never tried almond butter! Thanks for such a great opportunity! I tries cashew butter and just love it. I craved all during my pregnancy. Peanut Butter is the only one I have tried. Thanks for the contest. Unfortunately just plain peanut butter but would love to try some others. Yum. I have only tried peanut butter but these flavors look amazing. I have only tried peanut butter but would love to try the others. Thanks for the chance. I've tried smooth and crunchy peanut butter, crunchy being my fave. I've also tried an almond/peanut butter mix which was quite good. I've had peanut, almond and cashew butters, and enjoy all of them. Thank you for the offer! I've never tried this before so this would be a great way to try them. Ive had peanut butter, and sunflower butter, but thats it. Just peanut butter for me but I've always wanted to try cashew and almond butters. we've only tried peanut butter. i know, we're lame-o. i follow your other twitter id: @mmmyatt. Almond butter is my fave, but peanut is a really close second. I've only tried plain old peanut butter and nutella. But I think that almond butter sound soooo good!! I have tried almond butter before and it was delicious! We have only had peanut butter, but would love to try some others (like cashew butter). Only peanut butter here. I'm interested in the almond butter as well as the others. I have only tried peanut butter and cashew butter, they others sound great. I've only tried peanut butter. We like almond butter, cashew butter, and hemp butter. I have only had regular peanut butter and would love to try these with my kids and hubby! I have of course had peanut butter! I've also had soy butter and I found it (at least the brand I tried, Beanit Butter) had a strong taste that I wasn't quite fond of. The cashew butter sounds divine!! Christina - xristya@rock.com - I've tried peanut butter, almond butter, and sunflower butter, and love them all, and thanks for the wonderful organic giveaway! I've had almond and peanut-- but I'm pretty open to anything you can spread on bread. I've only ever tried peanut butter, but these other nut butters sound wonderful. I have only tried peanut butter. I would LOVE to try the cashew butter! I feel like I should have tried other nut butters, but I have only sampled peanut butter. I bet I would LOVE almond butter and I would love to sample cashew butter too. Mmmmmm... these all sound delicious to me! We go through lots of peanut butter in my house, so this would be a well-used and much-loved win! Thanks for the giveaway! I have tried Nutella and regular peanut butter. I would love to try the other types!! Peanut butter is all I've tried. I have only tried peanut butter, but would love to try these other types. I am subscribed to Bonggamom Finds by email. I am subscribed to Finding BonggaMom by email. I follow bonggafinds on twitter. My user name is imaclutz89. I follow bonggamom on twitter. My user name is imaclutz89. I've only tried peanut butter, but I bet the other kinds would be great. Thanks for the giveaway! I have only tried peanut butter - but the others sound great! I'm following bonggafinds in blogger. I have only tried peanut butter but I really want to try the almond butter! Thanks! I'm subscribed to Bonggamom Finds. Thanks! I'm following bonggamom finds on blogger. Thanks! I've only tried peanut butter and almond butter. I have tried regular peanut butter and while vacationing in CHina I tried a peanut putter with rice crispy in it. It was the most delicious peanut butter.